Gorgeous lines adorn these high quality center console boats that work equally well as your fishing machine or the tender to your yacht. The totally unique lines of the Mag Bay are the perfect marriage between a classic and modern look. She looks as sleek at the dock as she does slicing the seas offshore. Top quality components come standard on a Mag Bay, as well as many of the features that other’s call options. 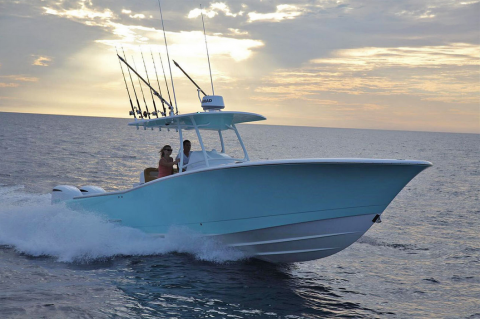 While many desirable features come standard, each build offers semi-custom additions that allow owners to rig their ride to match their style, be that fishing or cruising. The creators of the Mag Bay have a long history in boat-building success. As co-founders of Cabo Yachts, quality and customer service have long been a family tradition. A Day at the Lake from Mag Bay Yachts on Vimeo. Mag Bay Yachts 33 in Newport Beach, CA from Mag Bay Yachts on Vimeo.